News - Julian Garner teaches the guitar in North Dorset and plays the classical guitar at a monthly event in Blandford Forum. Julian Garner and recorder player Patricia Hopkins will be performing a short set at the Farnham Chamber Music Club in Surrey on Sunday 16th March. There will be a Sonata by Thomas Arne, Julian and Pat's arrangement of Debussy's La fille aux cheveux de lin and Julian's lively and popular folk-inspired piece, Dorset Street. For further details, email julian@renrag.co.uk to get in touch with Julian. Julian has composed his first song for many years. For tenor and classical guitar (or piano), it's inspired by Alfred Wainwright's writings about the Lake District. The style of the music is more classical than his earlier singer-songwriter and rock band compositions, no doubt influenced by an interest in the music of Britten, Gurney, Vaughan Williams and Berkeley. Julian has also arranged Ivor Gurney's Five Elizabethan Songs for guitar and voice. Another influence on his song writing is the experience of three years (so far) as a tenor with the Bournemouth Symphony Chorus, with whom he's enjoyed performing in Poole, Wimborne, Sturminster Newton, Brockenhurst, Cheltenham, Bristol, on Portland and in the cathedrals of Exeter and Winchester. Both his singing teacher Theresa McGowan and BSC Chorus Master Gavin Carr have inspired him, and their valuable technical advice has undoubtedly improved the quality of Julian's song writing, something he looks forward to doing more of in the future. Although our guitar meetings are no longer monthly, we have enjoyed two meetings in 2013 and a concert. The concert in June in Tarrant Monkton church was well attended and raised �0 for the church maintenance fund. Julian performed several pieces accompanying recorder player Pat Hopkins. They played Julian's three short duos for recorder and guitar (composed in around 2003, but this was their first concert performance!) and some Dowland and Bullard. Chris Gillson also played Dowland, but on an 8-string guitar he made himself - a memorable performance. The mix of guitar music and poetry was well received. Then in October 2013 we had a normal, more informal meeting of the group of classical guitar players, in a new venue which we all enjoyed - Tarrant Hinton village hall. Here, Julian gave his first performance of Gary Ryan's entertaining Rondo Rodeo. The performance went very well, and he also played Alla Cubana from Walton's Five Bagatelles. It was also Julian's debut as a solo tenor, singing Sleep by Ivor Gurney with Tania playing Julian's accompaniment, arranged from the piano part. Julian has now arranged all five of Ivor Gurney's Elizabethan songs for guitar and voice, as well as Vaughan Williams' Silent Noon and Lennox Berkeley's Bells of Cordoba. Any serious guitar/voice duos out there reading this are welcome to get in touch with Julian for a free copy of the scores, fully notated on Sibelius. Most of the pieces are yet to be performed (but we are working hard on it!) and none has been recorded. Thank you to all who attended the October meeting, including six of Julian's pupils, especially Ali, Sorrel and James, who all played. Many thanks to the 15 classical guitarist and a record total of 28 people who attended the North Dorset Guitar Forum in Tarrant Keynston Village Hall. This gave us the chance to enjoy the special sound of classical guitar solos, duos and trios performed on a stage in a larger venue with great acoustic from the wooden stage and floor. Julian performed Gary Ryan's 'Across The Plain' and he and Tania also played his four-movement guitar duo Chasing Elysium, composed and first performed in 2007. There were several duos, including three Scarlatti sonatas from Chris Gillson and John Edwards. Good to try a different venue.The next NDGF meeting/concert will be on 29th June at Tarrant Monkton church, which we've enjoyed once before, last June. This will be a concert in aid of the church, the small and historic All Saints church next to the Langton Arms pub. 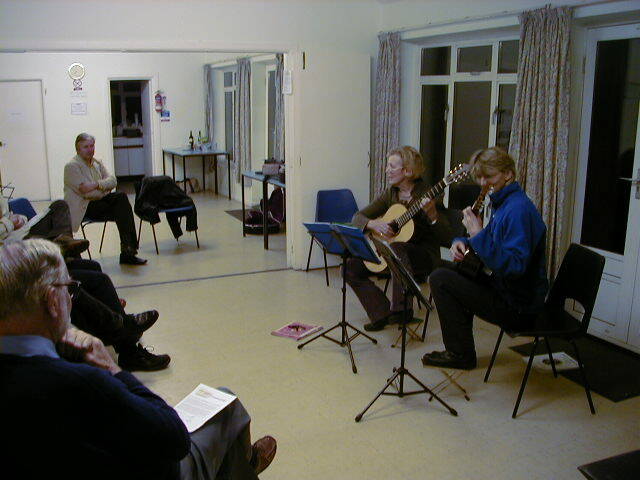 The North Dorset Guitar Forum, a chance for classical guitarists to perform in an informal concert, will start up again on an occasional basis on Saturday 16th February 2013 at 7.30pm. The venue on this occasion will be Tarrant Keyneston Village Hall, DT11 9JE. Until August this year, the Forum had taken place monthly Blandford Forum for five years. If you'd like to receive email updates about future classical guitar evenings, please email Julian Garner at julian@renrag.co.uk. Guitarists are also requested to email to let us know what they want to play. These evenings sometimes open with short pieces by beginner guitar students and end (at around 10pm) with more experienced performers. We also enjoy hearing pieces from other players of acoustic instruments, and from singers. You will receive a programme of the night's repertoire, along with light refreshments in the interval. There will be a charge of �for the February event (whether you've come to play or to listen), to cover venue hire and refreshments. The North Dorset Guitar Forum is taking a break for a while, after giving classical guitarists an opportunity to perform for 63 months in a row. The final meeting at Blandford Forum took place at the Woodhouse Gardens Pavilion on 16th August 2012, where Julian played Edradour (an early composition of his from 2000), Zest for Life (composed in 2010 in memory of his father) and two of William Walton's Five Bagatelles, Lento and Alla Cubana. A big thank you to all who have attended and played since 2007. Please email Julian Garner at julian@renrag.co.uk if you would like to be included on the email list for future events. When the event starts up again in 2013 at a different venue and probably bi-monthly, regular emails will resume to those who have asked to be kept informed. Julian remains busy with his guitar teaching commitments, and has vacancies for one or two more beginner or intermediate classical guitar players at the moment. Our successful guitar evening in June, a record attendance for the event in over 5 years, raised � for All Saints Church, Tarrant Monkton, where it was held. 12 players were heard in this ideal setting for guitar music. 10 of us enjoyed a drink afterwards at the nearby Langton Arms pub. The next North Dorset Guitar Forum will be on Thursday 19th July 2012 at 7.20pm, and it's back, as normal, to the Woodhouse Gardens Pavilion, next to Blandford Forum Post Office (postcode DT11 7DN). This is a well-established (monthly since 2007) get-together and informal concert given by local classical guitar players. All we need is �50 on the night from everyone attending. If you'd like to receive regular email updates about these monthly classical guitar evenings, please email Julian Garner at julian@renrag.co.uk. Guitarists are also kindly requested to email to let us know what they want to play. These evenings sometimes open with short pieces by beginner guitar students and end (at around 9.45pm) with more experienced performers. We also enjoy hearing pieces from other players of acoustic instruments, and from singers. A programme of the night's repertoire is provided on the night, along with light refreshments in the interval. The Farnborough Symphony Orchestra has this review of their 90th Anniversary Prom Concert at the Princes Hall, Aldershot on 16th June 2012. As a result of this very enjoyable event, Julian Garner has a new 'instrument' to add to his performances over the years on violin, synthesizer, vocals and various guitars, having played the floor polisher in Malcolm Arnold's 'A Grand, Grand Overture'! This also gave him the chance to fall over and play dead on the Princes Hall stage towards the end of the overture (for obscure comedic reasons required of this work, commissioned by Gerard Hoffnung in the 1950s), which is the closest he will ever get to acting! The role of floor polisher was played by Sir David Attenborough at the 2009 Proms, which allows Julian to feel not entirely embarrassed about his role in the proceedings. Other friends and patrons of the orchestra played vaccuum cleaners. Julian's father, Clifford (who would have been 90 in July), was for many years the orchestra's principal cellist and treasurer, and his grandfather, Sir Harry Garner, was the founding treasurer in 1922. The next North Dorset Guitar Forum will be on Thursday 21st June 2012 at 7.20pm, but not at the usual Blandford venue. On this occasion only, we will be at All Saints' Church, Tarrant Monkton, next to the Langton Arms pub. The Forum is a well-established (monthly since 2007) get-together and informal concert given by local classical guitar players. The regular venue is The Woodhouse Gardens Pavilion, next to Blandford Forum Post Office (postcode DT11 7DN). All we need is �50 on the night from everyone attending. If you'd like to receive regular email updates about these monthly classical guitar evenings, please email Julian Garner at julian@renrag.co.uk. Guitarists are also requested to email to let us know what they want to play. These evenings sometimes open with short pieces by beginner guitar students and end (at around 9.50pm) with more experienced performers. We also enjoy hearing pieces from other players of acoustic instruments, and from singers. A programme of the night's repertoire is provided on the night, along with light refreshments in the interval. The next North Dorset Guitar Forum will be on Thursday 19th April 2012 at 7.20pm in Blandford. This is a well-established (monthly since 2007) get-together and informal concert given by local classical guitar players. The Woodhouse Gardens Pavilion is next to Blandford Forum Post Office (postcode DT11 7DN). All we need is �on the night from everyone attending. If you'd like to receive regular email updates about these monthly classical guitar evenings, please email Julian Garner at julian@renrag.co.uk. Guitarists are also requested to email to let us know what they want to play. These evenings sometimes open with short pieces by beginner guitar students and end (at around 9.50pm) with more experienced performers. We also enjoy hearing pieces from other players of acoustic instruments, and from singers. A programme of the night's repertoire is provided on the night, along with light refreshments in the interval. DO YOU WANT TO PLAY YOUR CLASSICAL GUITAR TO A FRIENDLY NORTH DORSET AUDIENCE - OR BE PART OF THAT AUDIENCE? If this appeals to you, please join us at the North Dorset Guitar Forum on Thursday 15th March 2012 at 7.20pm in Blandford for an informal concert given by local classical guitar players. The Forums are monthly at the Woodhouse Gardens Pavilion next to Blandford Forum Post Office (postcode DT11 7DN), and have been running now for five years. All we need is �in the jug from everyone attending. If you'd like to receive regular email updates about these monthly classical guitar evenings, please email Julian Garner at julian@renrag.co.uk. Guitarists are also requested to email to let us know what they want to play. These evenings sometimes open with short pieces by beginner guitar students and end (at around 9.50pm) with some highly experienced performers. We also enjoy hearing pieces from other players of acoustic instruments, and from singers. A programme of the night's repertoire is provided on the night, along with light refreshments in the interval. The Bournemouth Symphony Chorus commissioned a major new choral work for their centenary, a 55-minute cantata composed by Richard Blackford. First performances at Cheltenham Town Hall and Poole Lighthouse were greeted with standing ovations and received excellent reviews in the national press. Julian Garner enjoyed playing his part in the performances and then the recording of the work, as a tenor in a choir of around 150. The Chorus was performing and recording with the Bournemouth Symphony Orchestra under Gavin Carr, with soloists baritone Stephen Gadd and tenor Paul Nilon. Not In Our Time, a dramatic, moving and beautiful work on the theme of religious war across the centuries up to 9/11 and beyond, will be available on CD in November, and can be ordered here. WANT TO PLAY YOUR CLASSICAL GUITAR TO A FRIENDLY NORTH DORSET AUDIENCE - OR BE PART OF THAT AUDIENCE? If so, why not join us at the North Dorset Guitar Forum on 18th August in Blandford for an informal gathering of people who share your interest? The Forums take place monthly at the Woodhouse Gardens Pavilion next to Blandford Forum Post Office (postcode DT11 7DN), and have been running now for over four years, with more than ever attending so far in 2011. They take the form of an organised but informal concert in two parts with a break for refreshments. All we need is �in the bowl during the interval from everyone attending. If you'd like to receive regular email updates about these monthly classical guitar evenings (the North Dorset Guitar Forum), please email Julian Garner at julian@renrag.co.uk. These evenings sometimes open with less experienced players and end (at around 9.50pm) with some highly experienced performers, making it a very rewarding evening of music. We also enjoy hearing from other players of acoustic instruments. A programme of the night's repertoire is provided on the night. To find out more or to let us know you're coming, or what you want to play, email julian@renrag.co.uk. The next Guitar Forum is on Thursday 18th August 2011 at 7.20pm - hope to see you there. To hear and see the performance of Julian Garner's short piece for guitar orchestra 'Float Up Together' given by the Dorset Guitar Society at its annual concert in May 2011, please follow this link. Also available here, the solo performance of Julian's piece If Only... by guitarist John Edwards. A short ensemble piece Julian composed for the Dorset Guitar Orchestra, Float Up Together, was given its first performance on Sunday 22nd May at 3pm at Kinson Community Centre, Millhams Road, Kinson, Bournemouth, BH10 7LH. This classical guitar event also included ensemble performances of Bach and Mozart as well as many solo and duo contributions by members of the Society. John Edwards performed Julian's recent composition "If Only...". For more information about the Dorset Guitar Society, visit the website www.dorsetguitarsociety.org.uk. If so, why not join us at the North Dorset Guitar Forum for an informal gathering of people who share your interest? The Forums take place monthly at the Woodhouse Gardens Pavilion next to Blandford Forum Post Office (postcode DT11 7DN), and have been running now for over four years, with more than ever attending so far in 2011. They take the form of an organised but informal concert in two parts with a break for refreshments. All we need is �in the bowl during the interval from everyone attending. If you'd like to receive regular email updates about these monthly classical guitar evenings (the North Dorset Guitar Forum), please email Julian Garner at julian@renrag.co.uk. These evenings sometimes open with less experienced players and end (at around 9.50pm) with some highly experienced performers, making it a very rewarding evening of music. We also enjoy hearing from other players of acoustic instruments. A programme of the night's repertoire is provided on the night. To find out more or to let us know you're coming, or what you want to play, email julian@renrag.co.uk. The next Guitar Forum is on Thursday 19th May 2011 at 7.20pm - hope to see you there. Julian Garner has had the pleasure of performing twice in the tenor section of the Bournemouth Symphony Chorus: once at Wimborne Minster (Britten: Saint Nicolas) and last week at Poole Lighthouse in a sell-out performance of Faure's Requiem and Poulenc's Gloria, in a programme which also included a stunning performance of Stravinsky's Firebird by the Bournemouth Symphony Orchestra under the baton of Kirill Karabits. If you'd like to receive regular email updates about these monthly classical guitar evenings (the North Dorset Guitar Forum), please email Julian Garner at julian@renrag.co.uk. Players and enthusiasts are welcome to the event, at the Woodhouse Gardens Pavilion next to Blandford Forum Post Office (postcode DT11 7DN). We also enjoy hearing from other players of acoustic instruments. These informal evenings sometimes open with less experienced players and end (at around 9.50pm) with some highly experienced performers, making it a very rewarding evening of music at just �per person. Refreshments are provided, as is a programme of the night's repertoire. Audience members are also encouraged to come along. To find out more or to let us know you're coming, or what you want to play, email julian@renrag.co.uk. The next Guitar Forum is on Thursday 17th February at 7.20pm - hope to see you there. It's been something of a sombre and reflective 2010, with Julian's father Clifford dying in February. During some marathon recording sessions in June and August, Julian composed and recorded a tribute to his father, Zest for Life. This is one of over 20 new instrumental recordings on solo classical guitar, many of which are new compositions performed for the first time within the last year or two. Some early mixes have been uploaded to the 'Listen' page (see the link at the top left of this page), so see what you think, and let Julian know at julian@renrag.co.uk. Meanwhile, Julian performs every month at the North Dorset Guitar Forum in Blandford Forum, North Dorset (see previous news item). A very happy Christmas and New Year to anyone reading this - see you in 2011! Classical guitar players and enthusiasts are welcome to the North Dorset Guitar Forum at the Woodhouse Gardens Pavilion (which has good acoustics for the guitar) next to Blandford Forum Post Office (postcode DT11 7DN). We also enjoy hearing from other players of acoustic instruments. These informal evenings sometimes open with less experienced players and end (at around 9.50pm) with some highly experienced performers, making it a very rewarding evening of music at just �per person. Refreshments are provided, as is a programme of the night's repertoire. Audience members are also encouraged to come along. To find out more or to let us know you're coming, or what you want to play, please email Julian Garner at julian@renrag.co.uk. The next Guitar Forum is on Thursday 16th December at 7.20pm - hope to see you there. Classical guitar players and enthusiasts are welcome to the North Dorset Guitar Forum at the Woodhouse Gardens Pavilion, next to Blandford Forum Post Office (postcode DT11 7DN). We also enjoy hearing from other players of acoustic instruments. These informal evenings sometimes open with less experienced players and end (at around 9.50pm) with some highly experienced performers, making it a very rewarding evening of music, in good acoustics for the guitar, at just �per person. Refreshments are provided, as is a programme of the night's repertoire. Audience members are also encouraged to come along. To find out more or to let us know you're coming, or what you want to play, please email Julian Garner at julian@renrag.co.uk. The next Guitar Forum is on Thursday 21st October at 7.20pm - hope to see you there. Julian doesn't play many gigs as a singer these days (being mainly a classical guitarist for the last two or three years, and currently recording over 20 of his instrumentals), but he has been persuaded out of 'retirement' by musician Ben Taylor, organiser of the first Open Mike night at the Kings Arms in Blandford Forum on Thursday 2nd September. Julian's performance (music from 8pm) will feature Given Time, Move On and The Urge to Return, partly because they're three of his best songs, but mainly because they're the only three he can still remember how to play! Classical guitarists (or other fingerstyle players) who can get to Blandford Forum are welcome to the North Dorset Guitar Forum at the Woodhouse Gardens Pavilion, right next to the Post Office (postcode DT11 7DN). We also enjoy hearing from other players of acoustic instruments. These informal evenings tend to begin (at around 7.20pm) with less experienced players and end (at around 9.50pm) with some highly experienced performers, making it a very rewarding evening of music, in ideal acoustics for the guitar, at just �per person. Refreshments are provided, as is a programme of the night's repertoire. Audience members are also encouraged to come along. To find out more or to let us know you're coming, or what you want to play, please email Julian Garner at julian@renrag.co.uk. The next Guitar Forum is on Thursday 16th September at 7.20pm - hope to see you there. Classical guitarists (or other fingerstyle players) who can get to North Dorset are welcome to the North Dorset Guitar Forum at the Woodhouse Gardens Pavilion, Blandford Forum (postcode DT11 7DN). We also enjoy hearing from other players of acoustic instruments. These informal evenings tend to begin (at around 7.20pm) with less experienced players and end (at around 9.50pm) with some highly experienced performers, making it a very rewarding evening of music, in ideal acoustics for the guitar, at just �per person. Refreshments are provided, as is a programme of the night's repertoire. Audience members are also encouraged to come along. To find out more or to let us know you're coming, or what you want to play, please email Julian Garner at julian@renrag.co.uk.The next Guitar Forum is on Thursday 15th July at 7.20pm - hope to see you there. The North Dorset Guitar Forum is otherwise known as the monthly classical guitar evening at the Woodhouse Gardens Pavilion, Blandford Forum, North Dorset. After three years of organising it (albeit with great success) Julian Garner suddenly realised that what it needed was a name! So the Guitar Forum does what we've always done on the third Thursday of every month - provides a regular chance for nylon-string players to get together and perform and chat in an informal atmosphere. You may want to gain a bit of performing experience or you may have something more ambitious in mind. And, although the focus is firmly on the classical guitar, we also welcome other acoustic instruments, whether solo or ensemble. There will always be a place on the night for something else, so if that might be you, and if you also enjoy listening to guitar music, please get in touch. Audience members are very welcome, too. To find out more or to let us know you're coming, or what you want to play, please email Julian Garner at julian@renrag.co.uk. A contribution of �on the night is appreciated. The next Guitar Forum is on Thursday 20th May at 7.20pm - hope to see you there. APRIL 15th - GUITAR EVENING AT BLANDFORD - MORE CLASSICAL GUITARISTS NEEDED! The next classical guitar evening at the Woodhouse Gardens Pavilion, Blandford Forum, North Dorset is on Thursday 15th April at 7.30pm. There are plenty of spots available this month for any classical guitarists who may be reading this, however experienced a player you are. This is a great chance to gain performing experience in an informal atmosphere or do something more ambitious if you want to - last month we enjoyed a half-hour set from Andy Khan. And audience members are very welcome, too. To find out more details or to let us know you're coming, or what you want to play, please email Julian Garner at julian@renrag.co.uk. A contribution of �on the night is appreciated. The Guitar Lessons page has just been updated to include as many examples as Julian can remember of songs and pieces he has either taught, arranged or performed over recent years. It includes a vast repertoire of cover versions (from Pink Floyd to Take That!). Julian regularly arranges guitar parts for songs requested by his students, but it's possible he has already worked on a piece you have always wanted to play, so do have a look at the list if you're a guitarist or interested in learning to play, especially if you already sing. Also listed are some of the classical guitar pieces he has performed, studied or taught. Julian Garner has been trying out some brand new instrumentals and some of his songs amongst friends and at small gigs. Apart from purely classical guitar pieces, it's been two years since his last solo gig, and this combination of material on steel-string guitar could be something he does more of in the future. On Saturday 6th March, at Charlton Marshall Village Hall, North Dorset, he was back on stage with his Lowden to perform a short set of instrumentals and a later set of songs. The instrumentals were: Walls & Bridges, Wetherbury and Cool Mystery - all originally written and performed on nylon-string guitar. The songs, familiar to those who saw him play in 2007-8, were Move On, Given Time (both from the Open Play album, still available from this website) and The Urge To Return. Julian said: "The Urge To Return isn't actually about wanting to get up on stage and sing again, but it might as well be, and I've never enjoyed singing these three songs more - I always felt they were three of my best. Playing and performing feels a lot easier and more relaxed these days, so I feel I should be doing more of it. I'd like to include more instrumentals, as I can't stop writing and learning them at the moment, and they're taking the music in some interesting directions, more laid back than the songs. I would definitely like to play in a duo rather than entirely solo, but it's good to know that I can go it alone if I have to. I keep wondering if there are any cellists out there who might be interested in working on some of my song and instrumental arrangements..."
Meanwhile, Julian continues to perform regularly on classical guitar, and can be heard next at the Woodhouse Gardens Pavilion in Blandford Forum on Thursday March 18th. Classical guitarists are welcome as ever to this event which Julian organises and introduces, so if you'd like to come to play or listen, contact Julian here. Arrive by 7.20pm if possible, music from 7.30 to 8.30 and around 9 to 9.45. I'm very sorry to say that my father, Clifford Garner, died on Tuesday 9th February, peacefully in Frimley Park Hospital with my mother, brother and me, after a short illness. He was still a very active musician of 87, falling ill only three weeks ago when he was about to go to a rehearsal with the Farnborough Symphony Orchestra, for which he also still served as Treasurer. Many of my musical friends will have seen him play the cello at my Blandford guitar events, most recently in August 2009 when he and Chris Daly (guitar) memorably performed some Vivaldi. I performed many pieces with him, starting with a cello/guitar duo I composed for his 80th birthday, and including arrangements of Faure, Purcell and Berkeley, and also trio arrangements with my mother on viola. He was always remarkably dedicated about playing my compositions, given their more contemporary style and the fact that he spent over three quarters of a century playing the chamber and orchestral music of the great composers! I've been very fortunate as a musician to learn from his vast musical experience, especially in recent years as I've spent more time composing, playing and reading music. So I will miss him for musical reasons as well as the many other ways he'll be missed by the family and by so many friends, whether they knew him through his work in aerodynamics as a mathematician, as a church member, leader of country walks or musician. There will be a celebration of his life at High Cross Church, Knoll Rd, Camberley GU15 3SY on Thursday 25th February at 2pm. Rather than send flowers, those who wish to mark his memory are asked to send a donation by cheque to 'The Stroke Association' c/o Camberley and District Funeral Directors, 337 Yorktown Road, College Town, Sandhurst GU47 0QA. The next classical guitar evening at the Woodhouse Gardens Pavilion, Blandford Forum, North Dorset is on Thursday 18th February at 7.20pm. There are still some spots available for any classical guitarists who may be reading this, however experienced a player you are - and audience members are very welcome, too. To find out more details or to let us know you're coming, or what you want to play, please email Julian Garner at julian@renrag.co.uk. A contribution of �on the night is appreciated. The next classical guitar evening at the Woodhouse Gardens Pavilion, Blandford Forum, North Dorset is on Thursday, January 21st at 7.20pm. There are still some spots available for any classical guitarists who may be reading this, however experienced a player you are - and audience members are very welcome, too. To find out more details or to let us know you're coming, or what you want to play, please email Julian Garner at julian@renrag.co.uk. A contribution of �on the night is appreciated. The Christmas classical guitar evening at the Woodhouse Gardens Pavilion, Blandford Forum, is on Thursday 17th December at 7.20pm. There are still some spots available for any classical guitarists interested, however experienced a player you are. To find out more details or to let us know what you want to play, please email Julian Garner at julian@renrag.co.uk. Music will include two new pieces by Julian: his captivating and meditative new three-movement piece Cool Mystery and his guitar duo arrangement of the carol In The Bleak Midwinter (listen out for the Andy Summers influence in the accompanying part!). Please come to listen if you don't play, as audience members are very welcome to what already promises to be a great programme of guitar music across the centuries, with plenty of quality performances from our regulars - and still all for just � Includes mulled wine, mince pies etc. The next classical guitar evening at the Woodhouse Gardens Pavilion, Blandford Forum, is on Thursday 19th November at 7.20pm. To find out more details or to let us know what you want to play, please email Julian Garner at julian@renrag.co.uk. If you get in touch a few days before the event you should be able to arrange a set of up to ten minutes - occasional longer sets can also be arranged. Please come to listen if you don't play, as audience members are very welcome. These informal concerts have been running monthly since April 2007, so why not come and take advantage of the opportunity to perform or listen and meet fellow players and enthusiasts in a quiet, small venue with very guitar-friendly acoustics. This month's classical guitar evening at the Woodhouse Gardens Pavilion, Blandford Forum, is on Thursday 20th August at 7.20pm. To find out more details or to let us know what you want to play, please email Julian at julian@renrag.co.uk. Playing time may be limited, but if you get in touch a few days before the event you should be able to book a 10-minute spot, and occasional longer sets can also be arranged. Please come to listen if you don't play, as audience members are very welcome. To celebrate the fact that Julian Garner has now given one thousand guitar lessons since he began teaching in 2004, here is some good news for any potential new pupils: your first lesson is completely free! You must get in touch before the end of September 2009, and it only applies to lessons given at Julian's studio, ten minutes from Blandford Forum, North Dorset. Full details on the Guitar Teaching page. Email Julian here to arrange your free session. As always, the third Thursday of the month is the date for a classical Guitar Evening at the Woodhouse Gardens Pavilion, next to Blandford Forum Post Office. This month's date for your diary is Thursday 16th July at 7.20pm, and please also make a note of August 20th for the one after that. To find out more details or to let us know what you want to play, please email Julian at julian@renrag.co.uk. Please come to listen if you don't play, as audience members are very welcome. A contribution of �per person is requested to pay for venue hire and refreshments. Although we are a classical guitar event (one of the very few of its type around) we enjoy featuring other instruments when the chance arises, and last month (18th June) we enjoyed David Robinson's fine clarinet playing accompanied by Bryan Phillips on guitar. So whatever instrument you play (whether solo or ensemble), why not arrange to come along and entertain and educate us guitar addicts with something a little different, whether it's a cello, violin, viola, acoustic guitar, voice, recorder or anything else. Maybe you'll even meet a classical guitarist for future collaboration! After all, Julian has written ensemble pieces involving classical guitar and each of the instruments mentioned above. Also last time in Blandford, Julian played four of his own pieces: the new extended version of Remember Her Dancing, old favourite Restless, new epic If We Can Laugh and his set of variations While The Sun Shines. Pete Kirkbride played a Prelude and Allegro by Bach and the first two movements of the Sonatina by Torroba, surely 20th century guitar music at its best, with suitably expressive performances. We also enjoyed two Dowland pieces, The Old Castle (by Mussorgsky, arr. Segovia), Farewell to Stromness (Peter Maxwell Davies) and Triptico (Antonio Lauro). If anyone would like to read Julian's articles for the Dorset Guitar Society newsletter about brilliant classical guitarist Craig Ogden's recital and masterclass in May, visit the DGS website here. This newsletter will also give you a flavour of what the Society has to offer for classical guitarists of all levels of experience in the Bournemouth area. It's been a long wait, but the first recordings of Julian Garner's music for a couple of years can now be heard on the Sound Samples page. This time he plays solo classical guitar, recorded in his studio, the Hide, North Dorset, in March 2009. The 'samples' are in fact entire pieces: While The Sun Shines (Theme and Variations) lasts around 10 minutes and shows influences from folk, classical and even progressive rock, and there are several short pieces from Julian's Seven Friendly Sketches: Friday Afternoon, Heart-throb, Piece of Cake, Remember Her Dancing and Unencumbered Spirit (which some of you may remember hearing as a longer instrumental on the CD Flowdown). All pieces have been performed at the Blandford Guitar Evening and are available in sheet music form for those of you who play the guitar - just email julian@renrag.co.uk for details. These tracks can also be heard on the recently updated MySpace website, where Julian's music has now received over 600 plays. The next Blandford Guitar Evening is at the Woodhouse Gardens Pavilion (next to Blandford Forum Post Office) on Thursday June 18th at 7.20pm, so why not come along to listen, or play if you're a nylon-string guitarist in the area? At the May event Julian performed his brand new untitled piece, which has already gone through many working titles including If We Can Laugh and Angles. At over 8 minutes, it's one of his longest and most substantial works for classical guitar, and he looks forward to performing it again on the 18th June. As always, third Thursday of the month means a classical Guitar Evening at the Woodhouse Gardens Pavilion (next to Blandford Forum Post Office). This month's date for your diary is Thursday 21st May at 7.20pm, and please also make a note of June 18th for the one after that. To find out more details or to let us know what you want to play, please email Julian at julian@renrag.co.uk. Please come to listen if you don't play, as audience members are very welcome. A contribution of �per person is requested to pay for venue hire and refreshments. Great value if it's anything like last month's event, which had some fantastic performances, including Rapha雔 Peraldi with Julia Florida (Barrios), Chris Gillson and John Edwards with Castelnuovo-Tedesco's Prelude and Fugue, and Pete Kirkbride not only playing Julian's new composition While The Sun Shines: Theme & Variations, but also giving an amazing and inspiring performance of JS Bach's Fuga from Sonata for Solo Violin N�in G minor, BWV 1001. The next Guitar Evening at the Woodhouse Gardens Pavilion (next to Blandford Forum Post Office) is at 7.20pm on Thursday 16th April. The following one is on May 21st. To find out more details or to let us know what you want to play, please email Julian at julian@renrag.co.uk. Please come to listen as well as to play. A contribution of �per person is requested to pay for venue hire and refreshments. On Thursday 19th March at 7.20pm another informal evening of classical guitar performances takes place in the very guitar-friendly acoustic space of the Woodhouse Gardens Pavilion. February's event at this intimate venue (next to Blandford Forum Post Office in North Dorset) was another well-attended one with performances from fine players such as Pete Kirkbride, John Edwards and Chris Gillson. Julian Garner gave the first performance of his new 10-minute set of variations While The Sun Shines. Despite being a classical guitar piece, the influence of Julian's progressive rock past can clearly be heard, though he also acknowledges the inspiration of 20th century English composer Sir Lennox Berkeley. If you want to play on the 19th, please get in touch before the event by emailing Julian Garner, who organises these increasingly popular monthly evenings. It's well worth booking your place and informing Julian of your repertoire (typically two pieces of no more than 10 minutes in total) as early as possible these days, so that he can be sure to fit you in. If you'd like to come and listen, you're very welcome to turn up on the night (but it would still be a good idea to exchange emails first). We just ask that everyone who attends puts a minimum of �in the jug so that venue hire and refreshments can be paid for. If you can't make it this month but would like to be kept informed with a regular email a few days before future events, please also get in touch. The Blandford Guitar Evening has been running successfully for a couple of years now since going monthly, with beginners and very experienced players equally encouraged to play. As long as everyone gains performance experience and enjoys classical guitar music, that's all that really matters. A number of players have found playing at Blandford tremendously useful in preparing for exams or more public recitals, and others have already made fine progress in overcoming performance nerves in a relaxed atmosphere. We hope to see you there. Another informal evening of classical guitar performances takes place at the Woodhouse Gardens Pavilion, next to Blandford Forum Post Office, on Thursday 15th January at 7.20pm. It's important if you want to play that you get in touch before the event by emailing Julian Garner, who organises the monthly evenings. But if you would like to come and listen, you're very welcome to turn up on the night (but it would still be a good idea to exchange emails first). We just ask that everyone who attends puts a small amount in the jug (normally �, so we can pay for venue hire and provide refreshments. If you can't make it this month but would like to be kept informed with a regular email a few days before the event, please also get in touch. The event has been running successfully for a couple of years now, with beginners and very experienced players equally encouraged to play. As long as everyone gains performance experience and enjoys the music, that's all that really matters. A number of players have found playing at Blandford tremendously useful in preparing for exams or more public recitals, and others have already made fine progress in overcoming performance nerves in the relaxed atmosphere we usually seem to have. Where else in Dorset (unless, of course, you're a member of the Dorset Guitar Society in Kinson, Bournemouth) is there such a regular opportunity to hear or play classical guitar music? The next event Julian Garner will be running for any classical guitarist near enough to North Dorset is at 7.20pm on Wednesday 19th November in Blandford Forum. Note that, although it's normally the third Thursday of the month, and will be again from December 18th, this is a one-off WEDNESDAY event. Please get in touch for full details. Last month we just happened to have plenty of South American music - you never know what to expect from the classical guitar's vast repertoire. "Julian Garner runs a monthly meeting for classical guitarists at the Woodhouse Gardens Pavilion in Blandford, attracting participants from across the county. It provides a chance for guitar players of all standards to gain performance experience and meet other musicians. It is also a rare opportunity for music lovers to enjoy the live sound of the classical guitar in a small venue with good acoustics. The sessions have been running successfully for 18 months, in the form of an informal concert with refreshments and conversation. Julian is keen to reach other guitar players all over Dorset who would be welcome to join the sessions." Anyone who plays or enjoys the classical guitar is very welcome to the next event Julian Garner will be running in North Dorset, so please get in touch for full details. It's at 7.20pm on Thursday 18th October in Blandford Forum. Last month's highlight was a wonderful set from Pete Kirkbride on his first visit to the Blandford Guitar Evening, including Capricho Arabe (Tarrega), Un Dia De Noviembre and Part III of El Decameron Negra (both Brouwer), Cordoba (Albeniz) and Julia Florida (Barrios). Inspiring stuff. These evenings are a rare chance for anyone at all who plays or is learning the classical guitar (and can travel to North Dorset) to gain valuable experience of playing in public, and also meet up regularly with fellow players. Any classical guitarist or anyone who enjoys listening to that style of music is very welcome to the next informal event Julian Garner will be running in North Dorset, so please get in touch for full details. It's at 7.20pm on Thursday 18th September in Blandford Forum. The classical guitar evenings organised by Julian Garner continue to be enjoyed by players and music listeners from North Dorset to Bournemouth. These events take place on the third Thursday of every month in Blandford Forum. The aim is simply to give classical guitar enthusiasts a regular chance to meet and play to each other. Julian will be very happy to hear from anyone who might be interested, so please feel welcome to get in touch. The next meetings are at 7.20pm on Thursdays 17th July and 21st August. "On Saturday 12th April about forty people, of all ages, gathered in the concourse to listen an informal concert provided by the Garner family and their friend Jenny Lee. Clifford played his cello, Heather played her viola, their son, Julian, played several guitars (not all at once) and also sang and Jenny played the violin. It was a really lovely evening with a range of music to suit a variety of tastes. The programme was arranged by Julian and included music by composers from the 16th to the 21st century, from Orlando Gibbons to Julian Garner with Bach, Faure, Villa-Lobos and Sting in between. Some of the pieces were conventional duets and trios, others were arranged by Julian to fit the instruments available and a significant number were composed by Julian himself. Julian played a classical guitar, [an electro-classical] guitar and a 12-string guitar. He is a very talented musician and it was a joy to listen to his compositions and especially to hear his music composed specifically for his family. The "Golden Trio" ended the first half, a trio for guitar, viola and cello, composed for Clifford and Heather's Golden Wedding, celebrated in August last year. My particular favourite, however, was a composition called "Circular Reflections", a duet composed by Julian for guitar and cello. The entire evening was most enjoyable and well received by everyone present. One member of the audience commented that it was particularly moving to watch the three family members playing music together and so obviously enjoying themselves. We cannot forget [Julian's brother] Richard, however, who was there in the audience to provide his support in a practical capacity. The proceeds from the concert, �9, were donated to the Concourse Fund. I hope that we do not have to wait too long before Julian arranges another musical evening. I will be the first in the queue for tickets." - Anne Randle. Julian is currently hard at work rehearsing and composing classical guitar solo and ensemble pieces. He performs monthly at his classical guitar evenings in Blandford Forum, North Dorset, and at the Dorset Guitar Society in Kinson, Bournemouth. He hopes to be involved in more public concerts later in 2008. Julian Garner will be taking part in an informal concert of varied chamber music and solos this Saturday, 12th April, at 7.30pm. This is at High Cross (URC and Methodist) Church, Knoll Road, Camberley, Surrey GU15 3SY. It will be held in (and is in aid of) the Church concourse. There is free parking both at the church and at the nearby multi-storey car park. There will be plenty of Julian's own ensemble instrumental compositions (variously with cello, violin and viola), as well as a number of classical guitar solos, three songs (including 'Move On' on a 12-string guitar and Sting's 'Shape of My Heart' on a classical with string duo accompaniment) and three short string trios (violin/viola/cello). He will be joined by Jenny Lee and his parents, Heather and Clifford Garner. Julian has no plans to appear as a singer/songwriter after this concert, guitar instrumentals being his main activity for the future, so why not come and hear him sing for what could be the last time, in what is mainly an evening of classical music, including works by Beethoven, Bach, Schubert, Faure, Gibbons and Villa-Lobos. Julian Garner has been organising informal Guitar Evenings in Blandford Forum since 2007. These currently take place on the third Thursday of every month. The aim is simply to give classical guitar enthusiasts a regular chance to meet and play to each other. Julian will be very happy to hear from anyone who might be interested in further details, so please feel welcome to get in touch. The next meetings are at 7.30pm on Thursdays 20th March and 17th April. Apart from expanding his guitar teaching in 2008, Julian Garner has decided to concentrate on classical guitar performance and composition for the rest of the year. This is an opportunity he looks forward to passionately, but the commitment required means that no further performances are planned in the role he has been best known for over the last eight years, that of singer/songwriter and acoustic guitarist. Plans to record new songs and write further ones have also had to be put aside, and it was not an easy decision. He would like to thank everyone who has supported him, especially over the last two years of gigging, and remains proud of the current acoustic CD of songs Open Play and the more rock influenced Your Good Self, both of which remain available from this site. Unfortunately, stocks of his previous album releases have now sold out and there are no plans to reissue them.